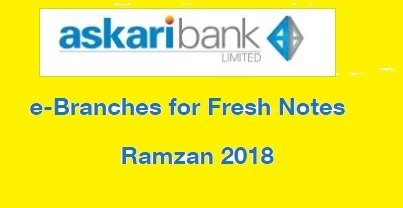 Askari Bank Limited has issued the E-branches list for issuance of new currency notes. This scheme has been launched on the eve of Eid ul Fitr. 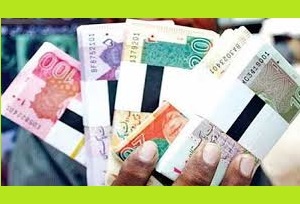 While Fresh currency notes will be available in the month of Ramazan ul Mubarak 1439 AH. General Public can get fresh currency notes from June 1 to June 14, 2018. How to use this New Currency Service? Under this facility, a person will be required to send an SMS message comprising his/her CNIC/Smart Card number along with desired bank branch code [e.g. CNIC Number (space) branch code] to 8877. The alphas numeric branch codes of nominated e-branches are available at SBP website www.sbp.org.pk and PBA website www.pakistanbanks.org. In return, the person will get SMS containing his/her transaction code, branch address and transaction validity date. This transaction code will be valid for a maximum of two working days. The person will approach concerned bank branch along with his/her original CNIC/Smart Card and short code received from 8877 and get the defined quota of fresh notes. It may be mentioned here that the quota of fresh notes to be issued comprises of two packets of Rs.10/- and one packet of Rs.50/- with an optional packet of Rs. 100/- as per availability of stock with the concerned branch. It is also notified that a person can get fresh notes quota only once from his mobile phone number using his CNIC/Smart card number during the service period. Charges for this SMS service 8877? The charges for these services are Rs. 2/- plus tax, therefore, people are advised to avail the facility only once since additional SMS will only add to their cost. For any complaint, the general public may call at SBP helpline at 021-3245-5470, 021-3245-5125, 051-9270754, 051-9271999, 042-99214424, 042-99210401-10 Ext:2265. 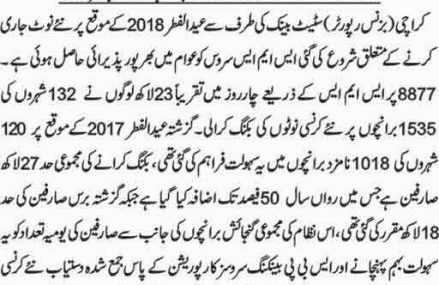 Alipur Chatha Tehsil Wazirabad District Gujranwala, Bahawalpur, Burewala District Vehari, Chiniot, Dsak district Sialkot, D.G.Khan, Faisalabad, Feteh Jang (Attock), Gujranwala, Gujrat, Hyderabad, Islamabad, Multan, amoki, Karachi, Lahore, Lalamusa, Mandi Bahauddin, Mianwali, Muzaffarabad, Pannu Aqil, Quetta, Rahim yar Khan, Rawalpindi, Sheikhupura, Sargodha ans Sialkot. Sms kb se send kr skty hn ??? ?